Monopoly Streets was delisted from Xbox Live Games on Demand between February 10th and October 8th, 2014. It was presumably delisted on PlayStation 3 around the same time. Electronic Arts held the Hasbro license from 2007 to 2014 and released several games based on their board games on numerous platforms. Ubisoft announced in August of 2014 that it was the new license holder for Hasbro properties resulting in the delisting of this and most other EA published titles. 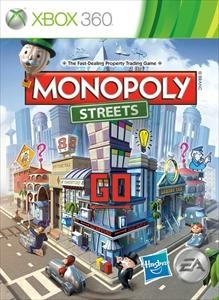 Monopoly Streets remains available on physical media for the PlayStation 3, Xbox 360 and Nintendo Wii where it was released as a standalone product and in the Monopoly Collection with Monopoly. “To celebrate its 75th anniversary, the world of Monopoly comes to life through a living, breathing city that you can build, own, and monopolize. MONOPOLY STREETS has everything you love about the board game, presented as a street level tour of Mr. Monopoly’s fully animated world.